Hey y'all! How's it going? 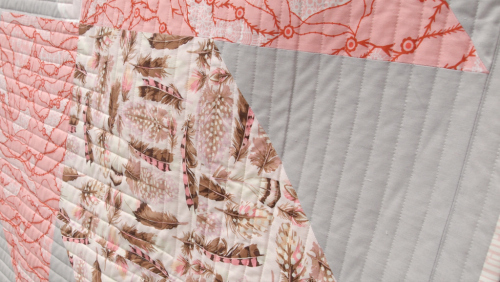 A few months back I showed the original incarnation of the Falling Maple quilt that I made for my friends' baby Vivian, and I got a few requests for a tutorial or pattern, so here it is! 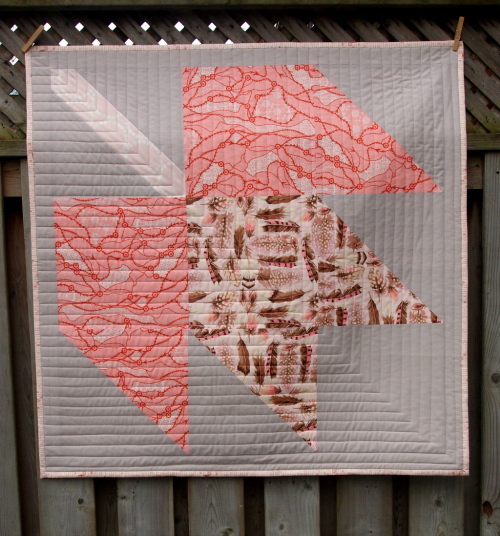 Falling Maple is an updated take on the traditional maple leaf block - I love taking traditional quilting blocks and making them into a one block quilt! 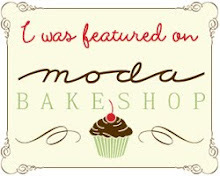 It's a great way to show off larger prints or special fabrics. This is the slightly scrappy version of Falling Maple, but it can also be done with only one print for the leaf (like Vivian's) or even scrappier. 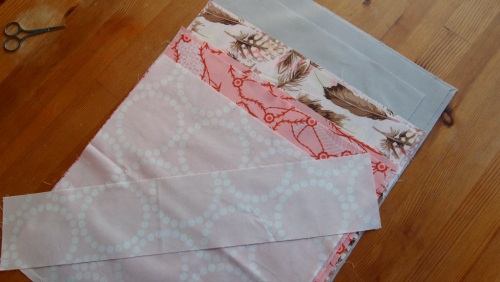 In the tutorial, I'll demonstrating how to make the scrappy version, but if you want to make a solid leaf version, simply replace the leaf fabrics with 3/4 yard of your preferred choice. *Finished quilt measures 40x40". All seams are 1/4" unless otherwise stated. Press in between steps. -From back ground fabric cut two 2.5x36.5" strips, two 2.5x40.5" strips, two 13" squares, one 12.5" squares, and one 10.75" square. -From first half yard, cut two 12.5" squares and one 13" square. -From second half yard, cut one 12.5" square and one 13" square. -From stem fabric, cut one 3.5x18" rectangle (ignore the matching square in the picture above, I changed the layout of my fabrics after taking this). 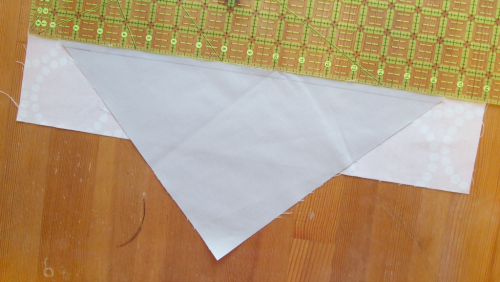 -Pair each of the 13" print squares with one 13" solid square for your half square triangles (HSTs). -On the wrong side of each 13" solid square, draw a line (using a pencil) diagonally from corner to corner. -Place one 13" solid square and one 13" print square right sides together. Pin. 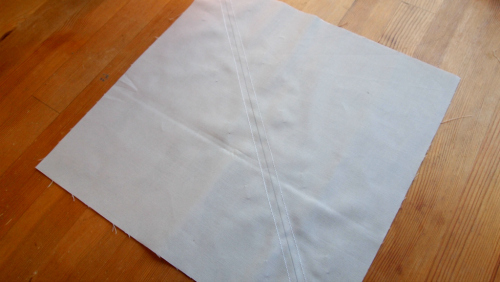 -Sew a seam 1/4" away on either side of the drawn line. -Cut the block in two along the drawn line. Open up each piece and press. 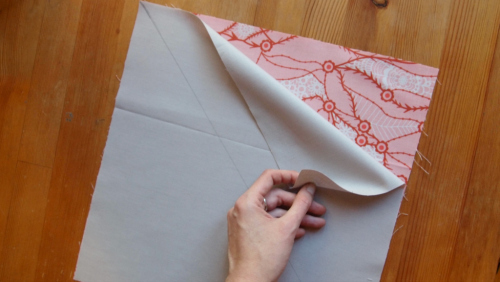 If necessary, trim the piece down to 12.5" square, making sure to trim off the little nubbins. Look at that - half square triangles! Repeat the above steps with your remaining pair of 13" squares. Now we're onto the stem block! 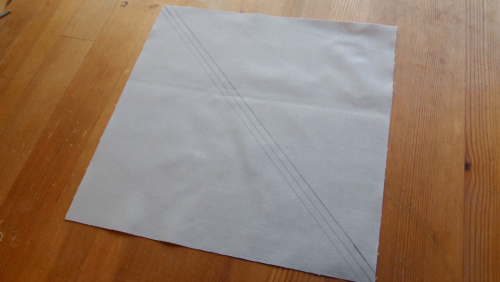 -Take the 10.75" square and draw a line (on the wrong side) diagonally from corner to corner. Draw another line 1/4" away on either side of the original line. -Using the middle of the three lines as a guide, cut the block in half so that you're left with two triangles. -Pair one triangle half and the stem piece, right sides together. Use a ruler to make sure that the triangle piece is centred on the stem piece. 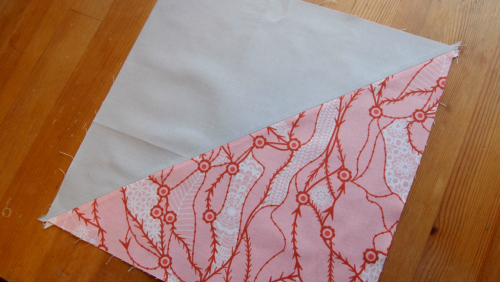 Pin and sew along the drawn line. -Repeat with the other triangle piece, making sure that it is also centred. Trim the piece down to 12.5" square, making sure to centre the stem strip (you can see this square trimmed in the picture below). -Lay out your blocks in a 3x3 grid following the layout shown in the above picture. 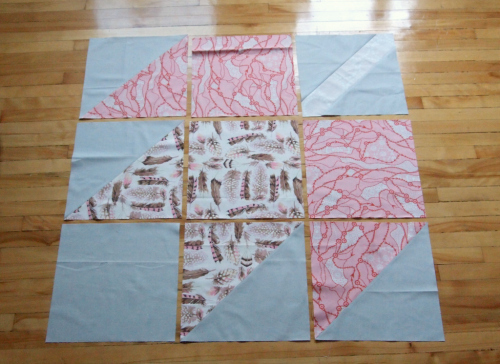 Sew the block in each row together and then sew those rows together! 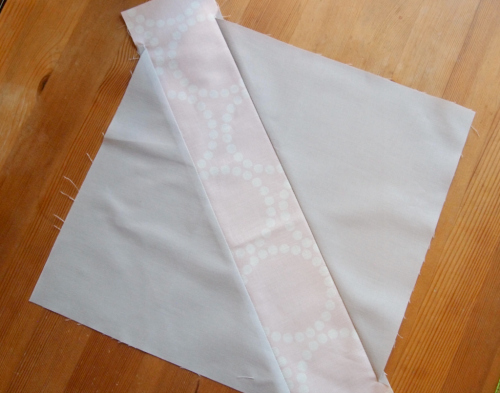 Sew a 2.5x36.5" strip to both the top and bottom of the top. 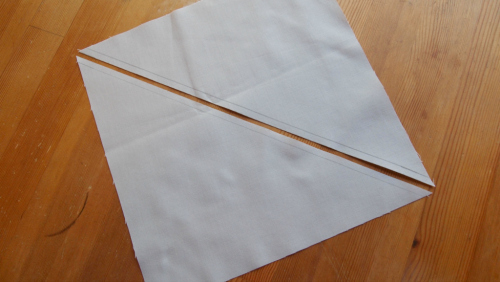 Sew a 2.5x40.5" strip to both the left and right sides of the top. -Sandwich, baste, and quilt as preferred. Bind as usual! If you're interested, the sample made for this tutorial is also available for sale in my Etsy shop! If you make a quilt using it, please feel free to email me or to add pictures of your completed project to the Miss Print Flickr pool. You might be the most talented and gorgeous person I know! Loved your tutorial. 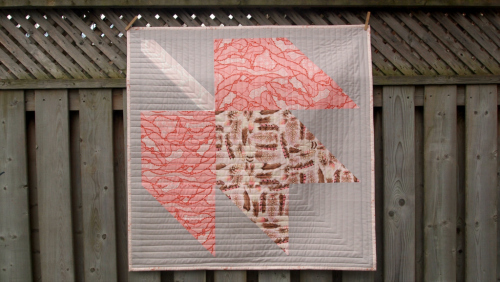 I added a photo of my quilt to your flickr account. Really quick. 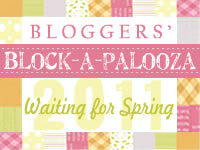 I started this on Friday night and finished it on Tuesday evening. Given to co-worker at baby shower today.